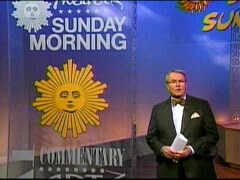 CBS’s Sunday Morning celebrated the 30th anniversary of its first broadcast in 1979 with host Charles Osgood citing CBS/New York Times poll numbers to demonstrate how American attitudes have changed over the past 30 years: "The majority of us now think homosexual relations between adults aren't wrong. That's a reversal from 30 years ago. As for sexual relations before marriage, the minority who disapprove is growing smaller. More people now support the legalization of marijuana than did 30 years ago. But still short of a majority. Views on abortion have hardly changed at all." In addition to cultural issues, Osgood also explained how Americans are now ready for socialized medicine: "On the matter of health insurance, nearly half of all Americans now want the government to provide it for all problems. That's up from just over a quarter of us in 1979." Osgood also claimed: "Just one American in eight thinks the nation is more powerful today than it was ten years ago. In 1979, it was one in five." Apparently Americans were more optimistic about American power at the end of the Jimmy Carter era than at the end of the Bush era. At the top of the show, correspondent Rita Braver did a similar look back at the last 30 years: "Three decades of change in our culture. Our communications, our politics." At that moment, a video clip of a gay marriage ceremony appeared on screen. After describing the end of apartheid in South Africa, Braver declared: "And the social order changed in this country, too." Braver spoke with Harvard history and economics professor Niall Ferguson and asked: "It does seem that white men are no longer calling all the shots." Ferguson replied: "Well, you're asking a white man if America-" Braver interrupted: " I know that, I'm asking you to fess up." Ferguson responded to Braver’s assertion by explaining: "I mean if there's one thing that has profoundly changed since 1979 it's been that women have significantly increased their influence in almost all walks of society." At that moment, images of Sandra Day O’Connor, Sally Ride, Danica Patrick, Hillary Clinton, Oprah Winfrey, and Condoleezza Rice appeared on screen, yet there was no picture shown of Sarah Palin. Ferguson went on to also describe the historic nature of Barack Obama’s election. Braver later spoke to public relations expert Marion Salzman and touted advances in science, such as "...awareness of global warming." Thirty years ago scientists were warning people of a new ice age. Braver also discussed "medical breakthroughs," asking Salzman: "Wasn't Viagra kind of a major discovery over the last 30 years? It was a fountain of youth for a lot of men." Salzman replied: "It was the great liberator." Braver concluded the segment by describing the last ten years: "But there's no doubt that in the last third of this 30-year period, America has faced increasing challenges. The September 11 attacks, wars in Afghanistan, and Iraq. And now the collapse of the housing and financial markets, the big three auto makers in crisis, and a jump in unemployment." Getting past the negative Bush years, Braver exclaimed: "Niall Ferguson reminds us that some important things have not changed...American optimism and creativity." Video footage of cheering crowds at Obama’s election night victory speech was shown on screen. CHARLES OSGOOD: 30 years and counting. We Americans have experienced quite a lot since Sunday Morning first went on the air. And the world around us has changed too. Rita Braver takes a look at the then and now. RITA BRAVER: It has been 30 years of transformation. Of good times and troubled times. UNIDENTIFIED MAN: Civil defense authorities have declared a nuclear alert. BRAVER: Three decades of change in our culture. BRAVER: Our communications, our politics. Our enemies have changed too. NIALL FERGUSON: In 1979, the Cold War was still in full spate. And yet, ten years later, the Soviet empire began to fall apart, beginning with the collapse of the Berlin Wall. And just two years after that, the Soviet Union didn't exist. BRAVER: Neil Ferguson, a Scotsman by birth, teaches history and economics at Harvard. Now, I think for most Americans, the great threat is Islamic terrorism. FERGUSON: I think almost certainly. BRAVER: More than 60 Americans are still held hostage in Iran this morning. FERGUSON: And it's worth remembering the extent to which 1979 was the year that that properly began to be a threat to the United States with the Iranian Revolution. BRAVER: It's been a time when the whole world seemed to be shifting. China became an economic power. UNIDENTIFIED MAN B: Nelson Mandela. BRAVER: South Africa ended apartheid. MAN C: the president of the Republic of South Africa. BRAVER: And the social order changed in this country, too. It does seem that white men are no longer calling all the shots. BRAVER: I know that, I'm asking you to fess up. FERGUSON: Yeah, and I think the answer is yes. FERGUSON: I mean if there's one thing that has profoundly changed since 1979 it's been that women have significantly increased their influence in almost all walks of society. UNIDENTIFIED MAN D: Oh, he got it. FERGUSON: And the status of African-Americans and other racial-ethnic minorities has greatly improve. And of course, the election of Barack Obama symbolizes what a transformation there's been. I think most people in 1979, if you polled them, 'will there ever be an African-American president?,' would have said inconceivable. BRAVER: Is this a 30-year period in which there have been more changes than in other 30-year periods or is it about the same? FERGUSON: I don't think so, but there's been much more rapid adoption of change. I mean, what's interesting is the speed with which a new technology gets adopted now. MARION SALZMAN: 30 years ago, I was probably sitting in a dorm room trying to figure out how to make my I.B.M. Selectric correct the paper I was typing. And today, I'm figuring out how to Twitter off my Blackberry, while I'm using my second Blackberry to place a conference call. BOB DOLE: I was concerned about possible post-operative side effects like erectile dysfunction, E.D. BRAVER: Wasn't Viagra kind of a major discovery over the last 30 years? It was a fountain of youth for a lot of men. SALZMAN: It was the great liberator. This blue pill came along and suddenly men could be boys, or they could be studs, or they could be whatever they wanted to be right up until their cardiologist told them absolutely not. SALZMAN: Marketeers realized that the big profit was in constantly trading up. The first car you bought was about getting the next car. The first credit car you got was about trading up to the next level of credit card membership. BRAVER: We also super-sized our portions and ourselves. In the late '70s, 15% of us were obese. Now it's 35%. We grew taller too. Both women and men grew about an inch these last 30 years. Women now average 5'4" and men 5'9.5". And families changed. We have children later. There are more single moms. Our lives got busier but there seems to be kind of a sense that there's more communication but it doesn't necessarily mean that it's more meaningful. SALZMAN: I do think that we have a lot more contacts today, a lot more people that we're loosely in communication with. And I don't think the extended family has that same reach when you're connecting with them via g-mail as maybe they did when you were connecting with them every Sunday at your grandmother's house over a big kettle of soup. BRAVER: But before you get too nostalgic, in 1979, the year Sunday Morning went on the air, we were in the middle of an economic nightmare. Inflation and mortgage rates reached 13%. FERGUSON: You had not just a recession, but remember you had stagflation, double digit inflation, high unemployment. JIMMY CARTER: The erosion of our confidence in the future is threatening to destroy the social and the political fabric of America. FERGUSON: And there was a sense, I think, at the time, of profound national malaise. And I think it was very widely felt to be a terrible time in the United States. BRAVER: We came out of it. And there have certainly been boom times since then. But there's no doubt that in the last third of this 30-year period, America has faced increasing challenges. The September 11 attacks, wars in Afghanistan, and Iraq. And now the collapse of the housing and financial markets, the big three auto makers in crisis, and a jump in unemployment. Marion Salzman says Americans of today will have to get used to a new way of living. SALZMAN: Some comforts, but there not going to be material comforts. They're going to be comforts of the soul. People looking to find satisfactions that they can get from quality relationships and accomplishing something good. BRAVER: And Niall Ferguson reminds us that some important things have not changed. UNIDENTIFIED MAN E: Isn't it great to live in America? BRAVER: American optimism and creativity. FERGUSON: And my bet is that even in the midst of this financial crisis, Americans will invent extraordinary new companies with extraordinary new technologies that will transform the world over the next 30 years. BRAVER: Tragedies and triumphs, behind us and to come.